Get a free Dims. tote when you pre-order Eave. Pre-order now. 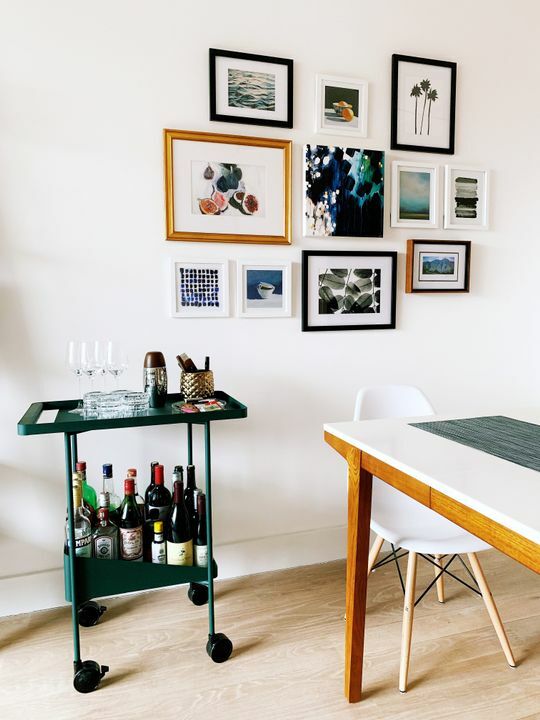 Bar cart, serving trolley, rolling table, kid’s room — the Barbican, can. Roll in the cart that can cart it all (and look good doing it). 25.6 × 15.8 × 27.6 in. A trolley that’s handsome and useful. That was our challenge. And to make a significant contribution to the architectural rolling cart furniture category (OK, this was further down our agenda). Ash wood handle meets hands at a natural height. Angled bottom tier secures bulky items. Constructed from strong, high-quality steel. Welded discreetly for maximum stability. Matte, fine-sand powder coat for scratch-resistant exterior and subtle texture. No VOCs or heavy metals like lead or chromium — those aren’t healthy. Ready to roll, out of the box — you did it! We show you our costs and how we price so you can make an informed decision. We share 6% of sales with our designers. Barbican Trolley – 25.6 × 15.8 × 27.6 in. Designed in New York, U.S.A. Wet cloth with soapy water. Wipe. Rinse. Barbican. On average, it costs $49 to ship Barbican to you. We only charge you $24. You get 60 days to try Barbican on us. Don’t love it? Send it back for a refund. Every Dims. original is backed by a 10-year warranty. Visibility is a New York-based product design office led by Joseph Guerra and Sina Sohrab. Hailing originally from Los Angeles and Detroit, they first met as classmates at the Rhode Island School of Design. The young duo shares a kindred belief: keen observation is the mother of innovation. Visibility has been commissioned to work on an array of design projects by clients such as Matter Made, Normann Copenhagen, Outdoor Voices and Away. The pair’s design philosophy is evidenced in Barbican, with the hierarchy of its thoughtfully tiered design and a handle integrated into the top surface to meet one’s hands at a natural height. Barbican is all-purpose furniture that blurs boundaries but feels instantly comprehensible. John Charles Strawn I. Reviewed by John Charles Strawn I. The Cutest and Extremely Well Made! The title says it all! Love everything about my Barbican Trolly and all of its uses. Great conversation starter too! 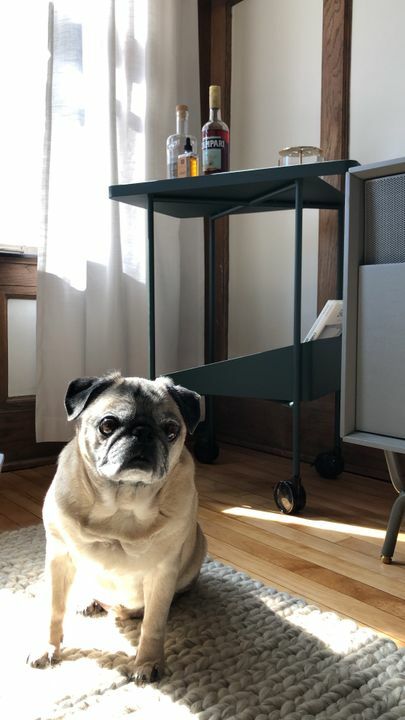 Laal S. Reviewed by Laal S.
I had been looking for a unique bar cart for my home and fell very much in love with everything about the barbican trolley -- the mix of powder-coated steel with the wood handle, the size, shape & the deep green color! It's super sturdy and incredibly visually appealing. Christine C. Reviewed by Christine C.
I do both color and cut and hate those ugly carts and trolly’s they sell at beauty supply stores. This is perfect! Can hold my foils and my shears and products without looking like a hot mess because of the beautiful fine line and easy to wipe up metal. So smooth and chic! Why didn’t anyone make one sooner?! Of course a brand new modern furniture company did! Thank god for people who are innovative and smart, creating beautiful MULTI use items that will last forever! Noah & G. Reviewed by Noah & G.
This bar cart is great! We were torn about the green color when we bought it (we generally don't go for bold colors like this), and we were so eager for it to come, but it was SO worth it. It's a beautiful piece, it was really well packaged, and it looks incredible. I am so proud of us for going for the green, it looks so badass and it's really well made. This has to be one of our favorite home-buys ever. Albert W. Reviewed by Albert W.
Sturdy! I must say I was not expecting such a sturdy trolley, but I can easily fit all my heavy weight liquor bottles on there and wheel them around with ease.....and might I say the wheels are quite smooth! It was SO NICE to not have to battle any styrofoam, plastic bags or tape with assembly, NO ASSEMBLY REQUIRED!!! Pulled it straight out of the box and into my kitchen to finally free my counter space from all the bottles. 16.5 × 16.5 × 20.6 in. 23.6 × 23.6 × 14.2 in. 55.0 × 29.5 × 29.0 in. Join our mutual appreciation club (AKA mailing list). Join our mutual appreciation club (AKA mailing list). Join our mutual appreciation club (AKA mailing list). Join our mutual appreciation club (AKA mailing list).